Rikers Island Could Be Closed And Replaced With Smaller Jails Around New York City : The Two-Way Mayor Bill de Blasio is committed to replacing the notorious jail amid reports of widespread violence by inmates and guards but says it won't be quick or easy. One plan would cost $10 billion. 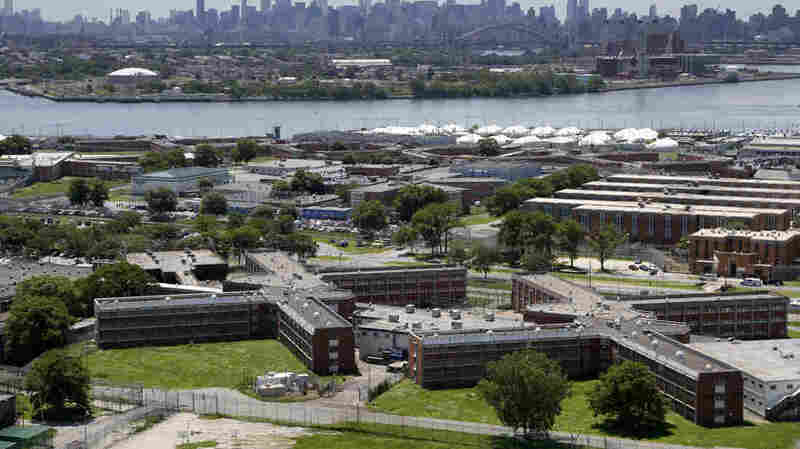 New York Mayor Bill de Blasio announced Friday that he's developing a plan to shut down the Rikers Island jail complex, seen in 2014. New York Mayor Bill de Blasio plans to close the city's notorious Rikers Island jail. But even he acknowledges that the process will not be quick or easy. "It will take many years," de Blasio said at a news conference today at City Hall. "It will take many tough decisions along the way. But it will happen." There are currently about 10,000 inmates at the Rikers Island jail complex, most of them waiting for trial. Amid reports of widespread violence by inmates and guards, the push to replace Rikers has been gaining momentum. Last year, de Blasio called that a "noble concept." But he stopped short of endorsing the idea because of concerns about the high cost. His administration pushed to reform Rikers Island instead. Now de Blasio is throwing his support behind a plan to phase out and replace the jail over the next decade. The pressure to close Rikers Island has been mounting since a scathing report issued by the Department of Justice in 2014 that found a "pattern and practice of excessive force" against adolescent inmates at the jail. That pressure grew after the suicide of Kalief Browder, a young man who was arrested for allegedly stealing a backpack. Browder spent three years at the jail — much of that time in solitary confinement — before the charges were dropped. "The death of Kalief Browder was a wake-up call to this city," de Blasio said. "His death shook the whole city and opened everyone's eyes and made people think twice." An expert panel that's been studying the issue for more than a year is expected to release its recommendations on Sunday. According to a draft plan obtained by The New York Times, the panel recommends replacing the Rikers Island complex and building smaller jails in each of the city's five boroughs, at a total cost of more than $10 billion. De Blasio would not say where those new jail facilities might be located. Any potential locations would require approval from the city council, and would likely face significant local opposition. "Right now, Rikers is an abomination," said City Council Speaker Melissa Mark-Viverito, because inmates are "warehoused" on an island in the East River between Manhattan and Queens, far from their families and friends. "That does not help anyone on a path to rehabilitation," Mark-Viverito said, "so the idea of a community-based approach is laudable, I think. And it will have to lead to tough conversations and tough decisions." Mayor de Blasio, who is running for reelection this year, said he was reluctant to close Rikers Island until a viable replacement was in sight. But de Blasio says falling crime rates and bail reform efforts convinced him that the city jail population could be brought down to about 5000 within a decade, making the plan to replace Rikers possible. "A year ago, we didn't think it could be done," de Blasio said. "It would been irresponsible for me to say we had a plan if we didn't have a real plan. We now have a real plan."